Yes all pellet stoves require a 80mm chimney vented to the outside air. if you have an existing chimney from a log burner, then in most cases this can be utilised or sleeved with a liner. If in doubt contact us and well arrange for a no obligation site survey to confirm. Do pellet stoves need electricity? Yes, for the ignition, automatic pellet feed and fan operation most pellet stoves need to be permenantly connected to a mains supply. However new to the market this year are models available that run on rechargable battery packs. How much electric do they use? An average pellet stove will consume approx 300w for 6 or 7 minutes during the ignition phase, then once running they consume approx 100w. No, pellet stoves are specifically designed to only burn the very dry ultra compressed pellets. Some models can be configured to run of other types of biomass such as almond shucks, or olive stones. Can they power radiators for central heating? Yes, hydro stoves or compact pellet boilers are designed for this purpose, they simply connect via 2 pipes to your existing radiator system to provide economical comfortable heating throughout your home. This depends on each persons perception of whats noisy. 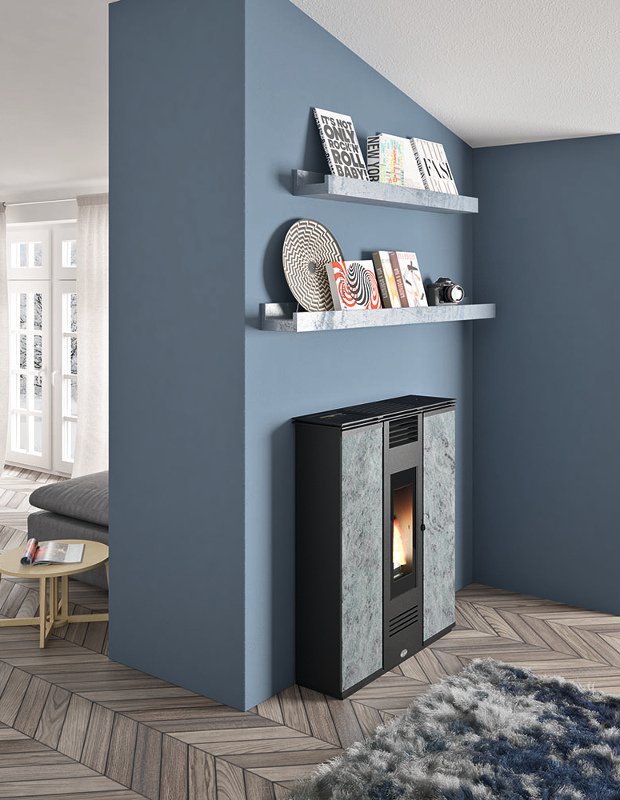 A standard pellet stove will operate at approx 59db on a medium fan speed setting, which will be similar to a ceiling fan, or airconditioner noise output. Ermetic Star and Silence models have the facility to disable the fan at low power resulting in near silent operation. What servicing do they require? After 900hrs or 1200hrs depending on software levels your pellet stove will display “Serv” to indicate that servicing is required. Solpellet can conduct this servicing for you at a very reasonable cost which includes a full chimney sweep. Can i programme my pellet stove to turn on automatically? Yes, all Solpellet pellet stoves have built in timer fuctions which allow you to control the start up and shut down times of your stove giving you you total autonomy of your home heating. Many models also have the option to be configuerd via wifi* so they can be controlled from anywhere in the world with a wifi connection.